THE FISHING HAS BEEN GREAT THIS PAST MONTH. IN MAY WE LANDED A NICE 19 POUNDER. 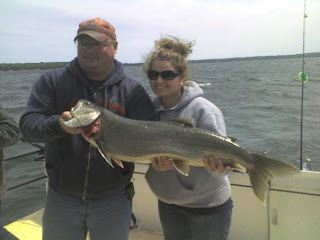 THE LAKE TROUT ARE AVERAGING 2 TO 5 POUNDS. MANY GROUPS ARE GETTING THEIR LIMITS. WE ARE ALSO STARTING TO CATCH WHITE BASS.